This look was inspired by one of my favorite fantasy stories, Lord of the Rings. 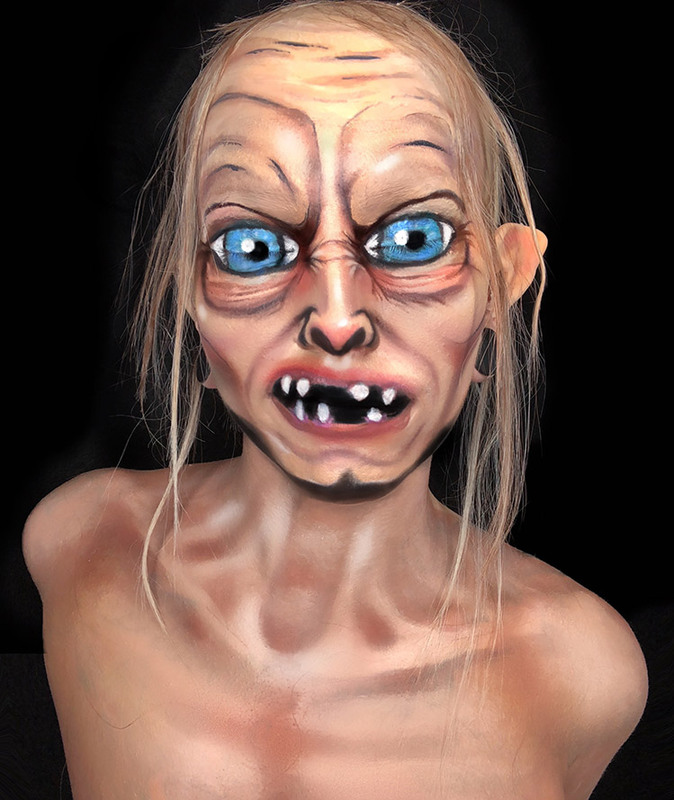 Nikkianne is a New York-based professional artist known for her special effects makeup and illusionary body art. Graduating from the Tom Savini Special Makeup Effects Program, her career began in 2010 and has been doing makeup professionally for 8 years. Prior to Nikki's rise on social media, she pursued a career in costume design and prop fabrication, creating armor and weapons from games such as World of Warcraft, Diablo, and Warhammer. Unable to support her art financially, Nikki set aside her dreams and moved forward with her day job. In 2017, Nikki found herself unhappy and unfulfilled in her career as a retail makeup artist, and decided to quit her full time job in order to finally pursue her art career. She decided if she couldnt afford to build costumes, she would just paint them on her instead, and within less than a year, she has gained thousands of followers and is well known for her character transformations and illusionary makeup. When Nikki isn't creating art on social media, she teaches private lessons, offers services to bridal parties, and freelances for various makeup companies in New York and along the East Coast. Although Nikki is new to social media, she is growing rapidly and she hopes to continue to teach her followers her artistic techniques, but more importantly she hopes to inspire her followers to follow their dreams. She is grateful for the opportunities she has been give and is excited to see how she will evolve over time. Nikki hopes to gain a large enough presence on social media so she can start hosting givesways in order to raise money for non-profit charities she believes in such as the American Foundation for Suicide Prevention and the Childhood Domestic Violence Association..